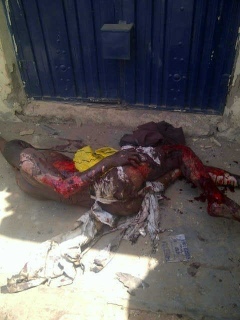 WARNING: Pictures from Thisday Kaduna office bomb blast scene ( Viewer discretion advised) | Life is short,have fun!!! This is a gory sight! May God intervene in Nigeria! God have mercy on them! It is unfortunate to see such unnatural things happening in this country.I will be happy if the government will make dialoged with the extremist. Oh God of creation interve in this Country.This is too much. say allah and kill people,is that mean allah sent them to kill people.all people calling allah think what kind of religion is that.think deep.i cant be a follower no more,i ll rather say MY GOD MY LORD,not [allah]cuz everytime people say allah their must be boooooooooom so pls dont allah,say my GOD my LORD. You r such a dumb fool.av u heard abt d identity of the person dt detonated bomb at kd yesterday?get ur fact correctly before u tend to rite rubbish dts could cause more problems to d already existing problem dt we all praying to God to put an end to. U are an idiot and a big fool Mr Anonymous, and whoeva u myt be. How about those singing praises and hailing in church services and then bombing their own churches? How many such incidences hav we seen. If u r ignorant, u must nt post comments like this cos it further exposes wht a used tool u are. NOW IS NOT THE TIME TO INSULT EACH OTHER. WE SHOULD BE THINKING OF THE WAY FORWARD LEAST WE WILL BE INSULTING EACH OTHER TILL WE BECOME VICTIMS. GOD/ALLAH HELP US. U are very stupid, do u tink it is those that are saying Allah that are behind this? No. U idiot…. Whatever has begining will have an end, if we rili want to end this the lord of the worlds(ALLAH SWT) wil ce us thru. Eating from the same pot of brotherhood with the perpetuator is the mean impediment. They claim to know them, why not expose them? when will this inhumanity stop? 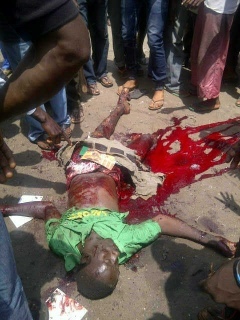 Chei nawaoo man inhumanity to a fellow man.what a heartless creature called Boko Haram,is it bcos God is slow to anger? Yes, really they don’t know Allah, if you really know who is Allah, you will not kill even an ant without reason. Infact, in my own thinking those behind these bombs here and there is not the work of Muslim at all.The govt should do us a favor of revealing the man caught. May Allah have mercy on those killed, and may He in his infinite mercy reveal those behind directly or indirectly. They will not rest in peace, their blood will continue to flow until justice is done! Blood seeks blood! Violence begets violence! Until the people behind these activities are destroyed and what they value rubbished the dead will not rest. Iam not happy being a Nigerian,Let me tell you there is nothing to be happy about,Nigeria needs more of actions than mere speech making,He knows the people behind this bombings but the fact is that those people are untouchable.Iam only praying for Revolution to take place in no distance time and the wrong will right itself. Whatever sect,group,tribe /people that has been doing this &indeed claim responsibility for this act,should ve a re-think &embrace peace bearing in mind constructive criticism. God help us in this country,Amen. All those behind these irrespective of religion will go to hell…. 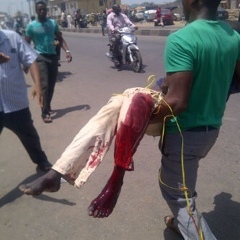 Dis dys pple ar heartless, nd ur northern leader knew wat is hppng,we di mass pryng 2god 2 deal wit any body behind dis!!! Is the bombing and killing not haram? Now pple ar heartless,di truth is dat ur northern leader know wat is going on, we pray 2god 2deal wit any body dat have hand in dis! God will fight for Nigeria,divine judgement will descend in no distant time on boko haram & all there sponsors. 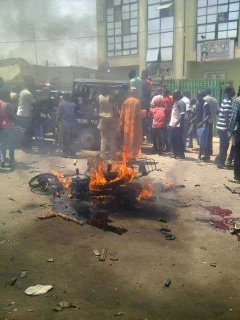 When will all these violence end in the Northern Nigeria?. Can one fight for God?. Nigerians what we have to bear in mind is that we have no right to take away any person’s life because we have to account for any life we take before God who created that life. Again please let human beings not fight for God because he is able to revenge for himself incase of those who say they are fighting for God. This is terrible….and this becoming sumtin else than wat the Government said is going on. Dis is terrible,may dere soul rest in perfect peace. THE FIGHT IS DEFINITELY BEYOND US. LET US ALL LOOK UP TO GOD THE AUTHOR AND FINISHER OF OUR FAITH. WE NEED TO GO BEFORE HIM IN PRAYERS AS NIGERIANS. WHERE ARE OUR RELIGIOUS LEADERS? LET THEM ORGANIZE SPECIAL PRAYER SESSIONS. WE WILL SUCCEED UPON THEM. just like wat we see in d movies. 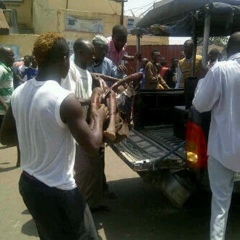 i neva knew a black man of nigerian extraction could strap a bomb to himself. wtf. innalillahi wainnailaihi rajiun, O Allah let those that are behind this know that it is the masses that are being victims of this blast, and that this will neves solve the problem rather creating more tension around the country. The government should also know that it is either directly or indirectly in this act. @Dan am not happy wit ur post have mercy on those victims, what do you think that an A.c of the police can contribute to the insecurity situation of the country takless of an uncommission officer. WE SHOULD LEAVE ALLAH OUT OF THIS. THERE IS MORE TO IT THAN MEET THE EYES. why are we making life difficult to our self when God did not make it difficult for us?Now what is the achievemement here?May Allah disgrace who so ever did this and grant peace to this country and the whole world.Amin.